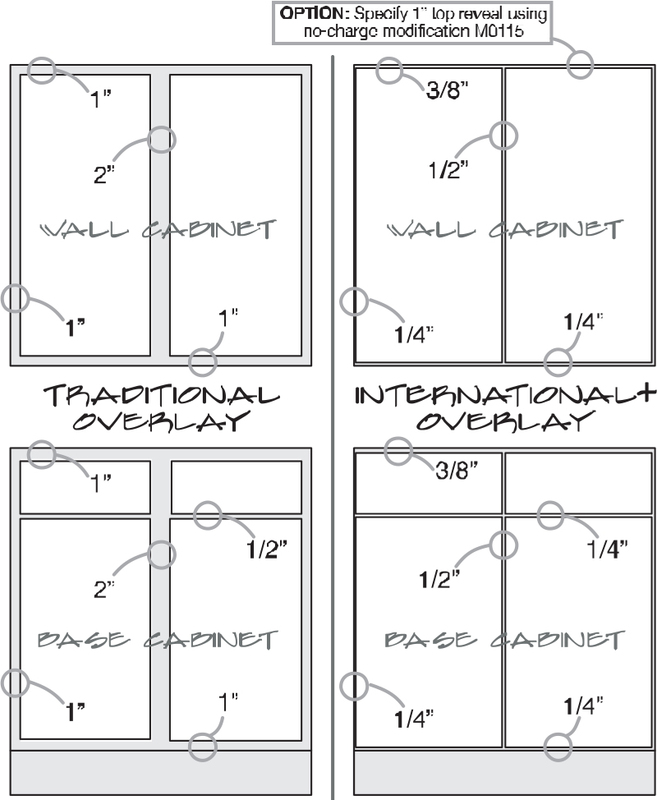 Most Cabinet Collection door styles are offered in two overlays: Standard and Full. “Overlay” refers to the amount of cabinet face frame that is covered by the doors and drawer headers. Full overlay doors and draft fronts are larger, covering more of the frame. The result is a more contemporary look with European overtones. Standard overlay doors and drawer fronts are smaller, revealing more of the frame. This look is in keeping with American cabinetry traditions. Since full overlays place the edges of doors and drawer headers closer to the edge of the box, care must be taken to avoid clearance problems. All Cabinet Collection’s cabinetry face frames are made of 3/4″ thick select solid hardwood components. Stiles and rails are joined together with concealed screws and wood glue for strength. Frames are dadoed to receive tops, bottoms and end panels. Cabinet end panels are 3/8″ plywood, dadoed to receive top, bottoms, and backs. Exposed ends that are called-out on the order will receive wood veneer which is stained, sealed and top-coated. Interior has a light-maple printed urethane-coated surface. Natural Wood Interior upgrade M0705 uses 1/2″ end panels with a UV-coated natural birch veneer interior. Use M0320 for 5/8″ plywood veneered flush end panels. Cabinet tops and bottoms are 3/8″ plywood laminated with a light-maple printed urethane-coated surface on both sides (a few selected base corner cabinet exceptions are noted in their respective section information). Natural Wood Interior upgrade will receive 3/8″ plywood tops and bottoms with a UV-coated natural birch veneer interior. Standard interior shelving is 3/4″ particleboard laminated on two sides with light-maple urethane-coated surface and matching PVC edgebanding on one long edge. Finished interior cabinets will receive 3/4″ veneer surfaced shelving with matching wood species edgebanding on one long edge. Natural Wood Interior upgrade will receive 3/4″ plywood shelves with a UV-coated natural birch veneer surface with matching edgebanding on one long side. Cabinet backs are 1/4″ thick plywood laminated with a matching light-maple printed urethane-coated surface on the interior. Natural Wood Interior upgrade will receive 1/4″ plywood back with a UV-coated natural birch veneer interior. Cabinet backrails are 5/8″ thick plywood. Backrails are visible from the back of the cabinet but are hidden from view on the inside. Cabinet Collection utilizes a four-sided drawer constructed with 3/4″ hardwood, using dovetailed joinery. Bottoms are 1/4″ plywood, fully captive within sides and ends. The standard drawer glide is a soft-closing Blumotion full-extension ball-bearing undermount glide. Soft-close guides are rated for 75-pound dynamic loads (work load with weights equally distributed, independently tested for thousands of cycles), and 100-pound static loads (weight at front edge of half-open drawer, independently tested for short period). Standard toe kicks are 4-1/2″ tall by 2-5/8″ deep. Universal design toe kicks are 8-3/4″ tall by 6-3/4″ deep. Cabinet toe kicks are 5/8″ plywood which fits between end panels and reaches the cabinet bottom. Toeboard trim is suggested to finish installation (TM0240). Roll trays have four-sided dovetailed construction with 3/4″ hardwood. Bottoms are 1/4″ plywood, fully captive within sides and ends. Roll tray glides have soft-closed action. The standard Cabinet Collection hinge has a soft-close mechanism with on/off adjustment. The Cabinet Collection hand-applied finish is sealed and given an oven-baked topcoat of catalyzed varnish for lasting durability. All finishes are offered in your choice of satin sheen (25 degree mid-gloss) and matte sheen (10 degree low-gloss). Prior to 2013, all Cabinet Collection’s stains and paints were finished in satin sheen; Vintage finishes were finished in matte sheen.